Status bar will no longer immediately show an orange Publishing error if a sync error occurs, it will stay blue and continue to attempt to Publish Content to the web server for 5 minutes. An alert icon is shown to indicate any current sync errors. After 5 minutes of attempting to publish content, the status bar will become orange and display the Publish Failed message. Site administrators now have more control over their password and account policy management. This includes password expiry, policies preventing you from using a previous password, password attempt lockouts, and idle session logout. In order to update the password expiry, stored passwords, max failed login attempts and idle session timeout, go to the Settings section in Agility and select Agility Global Security. 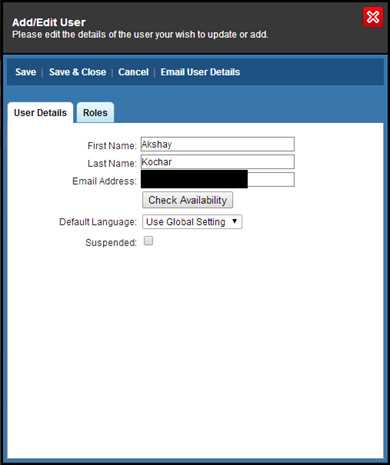 User accounts can now be suspended under Settings > Agility User Security > select a user and then check the box labelled “Suspended”. A “Suspended” user will receive a message next time they attempt to login notifying them that their account has been suspended. The Telerik Rich Text Editor has been updated to the latest version. This includes numerous bug fixes from the vendor. There is now a built-in mechanism to secure your custom reports from use outside of the Agility Content Manager. All custom reports in Agility are loaded within an iFrame and will now have a HASH and USER appended to the querystring. Using these values, a developer can perform their own logic to secure your custom report. //compare the hash to the one in the incoming request query string.